Is Integration Your Silver Bullet? Time to Get Real. Luckily my colleague Tanesha Peeples, the Deputy Director of Outreach for Education Post, took on the A.P., as well as Orfield and his ilk. Her response is below. Tanesha was born and raised on the South Side of Chicago, is a Chicago Public Schools (CPS) alumna and proud Englewoodian. Her vision is one where everyone—regardless of ethnicity, socioeconomic status, gender or zip code—can have access to a comfortable quality of life and enjoy the freedoms and liberties promised to all Americans. Hey, guess what? That whole school reform thing? They’ve figured it out. That’s right, it turns out all students can achieve, excel academically and grow to be well-rounded, successful adults…as long as they attend integrated schools. Sure, we’ve all seen the research. Not only can kids of color benefit from being in a diverse school, so can the White kids. But wait. People are making it sound like you can drop a bunch of Black kids in schools with a bunch of White kids and boom—the systemic inequities and public policy failures that have deeply segregated our cities for generations suddenly vanish. I can’t see it happening like that. For instance, the other day I saw this report from the UCLA Civil Rights Project concluding that integrating public schools in New Jersey was critical to improving educational outcomes for Black students. When I want to know what’s up in New Jersey, I turn to Laura Waters, who’s been blogging there for more than a decade. And she’s not buying it. Not only does she see a bunch of influence and dollars from teachers unions and groups who want to keep things the same, but she points out that the report provides no real-world solutions that we could actually, like, do. So I was thinking maybe I should write a response to that UCLA report—and then over the weekend comes a piece published by The Associated Press (AP) that straight up blames charter schools for increasing segregation in schools. Crazy, right? I mean, where was AP during…I don’t know, maybe the entire history of public education in America? I mean, let’s keep it real. Even after Brown v. Board sought to integrate our public schools, generations of racist housing policies have enforced hyper-segregated, high-poverty neighborhoods with struggling, under-resourced schools. 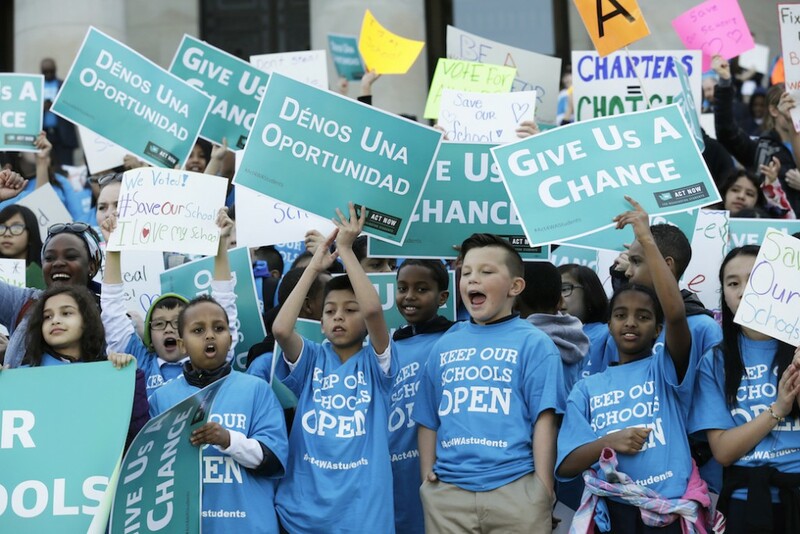 Charter schools showed up as one option to provide some (hopefully) better public options for these communities, and most of their students in these neighborhoods are, unsurprisingly, Black and low-income. Now AP looks at that and says, uh-oh, these charter schools are exacerbating segregation? How about those alternative facts, ladies and gentlemen. I don’t know Robin Lake personally, but she got the point across in under 280 characters. And come to think of it, weren’t charter schools getting slammed for not serving the local communities? Turns out you’re damned if you do and damned if you don’t. My colleague, Mike Vaughn, actually read down to the bottom of that AP piece and turns out parents are choosing schools that actually work for their kids. Imagine that. And my homie Erika asks where AP was when she was attending a highly-segregated school in a posh suburb. A real drop-the-mic moment on Twitter was when Chris Stewart came with the heat, suggesting that people either put up or shut up. If the authors, researchers, college professors, labor activists, and others really care about "segregation," they will immediately enroll their children in the blackest, poorest school they can find. We won't let you scapegoat black and brown parents for "segregation" because we choose charter schools. The invisible hand of white family choice is 100% responsible for segregation. Don't come for our choice until you address that reality. Oh, and schools with predominantly Black student bodies can work. After all, historically-Black colleges and universities (HBCUs) have been winning since way back when Black people weren’t allowed to attend public universities. But my favorite, Howard Fuller, came through and reminded us of what this is really all about.